Hurricane Florence is ravaging the US East Coast, knocking out power to more than 600,000 homes, causing buildings to crumble and stranding residents. The centre of the storm made landfall at Wrightsville Beach, North Carolina, with gales of up to 90mph (150 km/h). A powerful storm surge toppled trees and swamped streets in coastal areas. Dozens of people were rescued from a collapsing hotel in North Carolina. Evacuation warnings are in place for 1.7 million people. North Carolina Governor Roy Cooper told a news conference that whole communities "could be wiped away" by the 400-mile-wide hurricane. "This is an uninvited brute that just won't leave," he told NBC. The state's transportation secretary, James Trogdon, said the state may see flooding that normally only occurs once every 1,000 years. National Weather Service forecaster Brandon Locklear said North Carolina is likely to see eight months of rain in two to three days. Thousands of miles away a huge typhoon is moving towards the Philippines. More than five million people are in the path of Super Typhoon Mangkhut, officials say. The North Carolina governor said Florence was likely to "continue its violent grind across the state for days" as it crawls along at just 3mph (4.8km/h). Forecasters warned the storm surge, together with up to 3.5ft (1m) of rain over the next few days, could spawn a slow-motion disaster of catastrophic flooding. There were no immediate reports of any deaths or serious injuries. But US officials say the tempest remains extremely dangerous because of the high volume of rainfall and predicted deluge, even though its wind speeds lowered slightly on Thursday night, making it a category one hurricane. 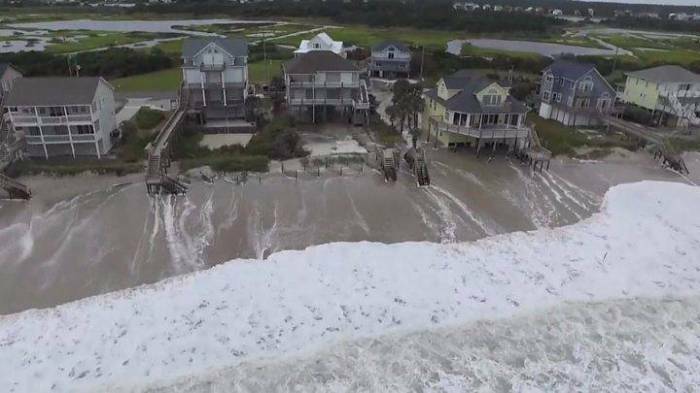 By Friday morning, the North Carolina coastal town of Atlantic Beach had already received 30in (76cm) of rain, the US Geological Service said.